Remember the bike lane-protected gutter Denver Public Works installed last year in front of Union Station, the city’s busiest transit hub? It was the cringeworthy element in an otherwise people-first redesign of the 17th and Wynkoop intersection — and easily the most viral #StreetFail of 2016. 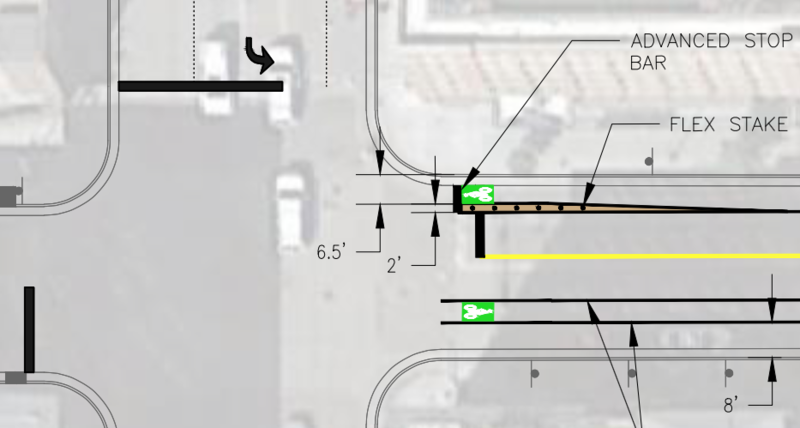 Now DPW says it will correct that design flaw with a protected bike lane on the Union Station side of Wynkoop Street. It will run two blocks, between 16th and 18th streets. Concrete curbs will stop cars from entering the bike lane, which DPW will paint tan to further distinguish it. Parked cars (as well as a bike corral and a B-Cycle station) will add extra protection from traffic. The eastbound Wynkoop bike lane, however, will not get any physical protection — despite drivers parking in it constantly to drop off and pick up passengers. Why? Unless parking is removed, there’s not enough room to protect both bike lanes from traffic, or build a two-way protected bike lane on one side of the street, say DPW reps.
At some unknown time down the road, Wynkoop may become a car-lite street and parking may be removed. Until then, crews will paint the bike lane green for two blocks, between 16th and 18th, and hope for the best. LaMie acknowledged that without physical protection, cars will still block the bike lane on this side of the street. “We acknowledge it, but it’s better than what has been there in the past, and it’s guiding us toward another step before considering the long-term vision that we’re still working on,” he said. DPW wants to get these “medium steps” done soon, in August, when Wynkoop is scheduled for a fresh pave, LaMie said. 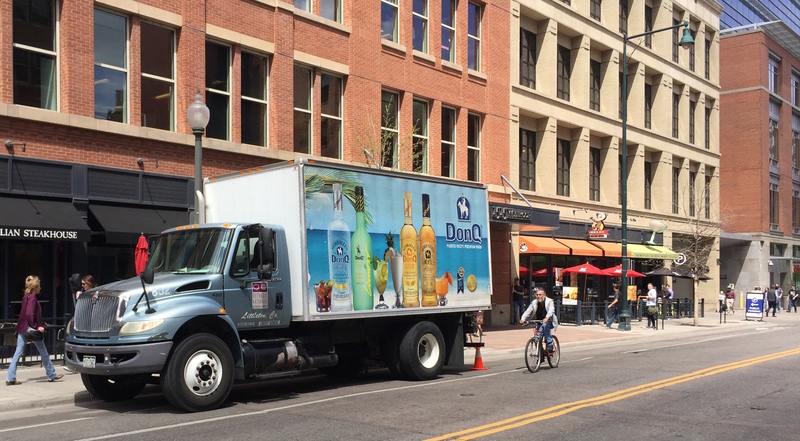 The section of Wynkoop in front of Union Station isn’t the only part of the street with bike lane problems, and DPW will implement some other fixes as well. People biking west on 15th Street toward the Cherry Creek Trail won’t have to worry about drivers treating the bike lane as a right-turn lane at that intersection anymore. DPW will add plastic posts and some paint to keep cars out. Crews will also paint a stop bar in the bike lane, slightly ahead of the stop bar for cars, to make bicyclists more visible to drivers when the light turns green. DPW will add the same treatment to the eastbound bike lane at 19th and Wynkoop. While the intersections may be better off, there’s nothing stopping tractor trailers and parcel trucks from parking in the unprotected, westbound bike lane on 15th. DPW reps said they’re looking at possible loading zones as well as adjusting delivery hours, but haven’t gotten far. So there’s no fix here beyond enforcement, which is very lax. Drivers parking in the row of angled parking between 15th and 16th will soon have to back into the spaces, so they can see people in the bike lane more easily when they pull out. I get when a single family residential neighborhood goes crazy when you try to remove street parking. I don’t agree, but I get it. Those people are reasonably likely to get that parking space in front of their house. For an area like this, the on street parking is a tiny drop in the bucket and any given person has very minimal chance of getting one of those spaces. For an area with as much retail and office space (and residential too), the 30 spaces they would have to remove would barely make a dent in available parking. Definitely incremental, but I do think it’ll help. The changes to back-in spaces between 15th/16th are much needed. I’ve been hit two different times by cars pulling in/out of those spaces, so I hope it does really improve the situation.